Why does financial innovation have such a gender problem? The stats for the industry are well-known – just 30% of the fintech workforce is female, the average gender pay gap in banks and building societies is 35%, and a meagre 2% of VC funding goes to female-founded companies – and the Lab is not immune to the problem. Despite a deep commitment to feminism, an all-female staff team, a female Executive Director and Chair, and a majority-female Board of Trustees, the number of women participating in our programmes is unacceptably low (about 1 in 3). What are the barriers to women taking part in our programmes – and in financial innovation more widely? And what can we do to replace them with enablers? Knowing that we couldn’t solve this problem alone, in June the Lab convened thirty female leaders from across the financial system to understand how we could begin to create change. We started with only one assumption: the source of the problem is not the skills and potential of the women themselves. Over the course of an intimate, lively and challenging discussion held under Chatham House Rule, we started to identify some of the key factors holding women back. The barriers to female leadership in financial innovation are both internal and external, and often there is a close connection between the two – for example, the media portrayal of women leading to feelings of low confidence. Many of the external barriers are subtle or hidden, such as organisational culture and the language used to speak about, for and to women, making it incredibly hard to identify, articulate and address those barriers – especially if this involves challenging another person’s behaviour. Key external barriers included the way in which the media portrays women and the societal attitudes this creates, particularly how ‘feminine characteristics’ are defined and valued across society. This influences, and is in turn influenced by, the words used to describe women, which inevitably shapes how we perceive ourselves and how we are perceived by others. Workplaces are often a microcosm of these dynamics, with organisational culture and norms of behaviour that disadvantage and allow for the mistreatment of women. While issues such as the glass ceiling, sexist jokes and harassment have been well-documented, they show no signs of going away. And they have a material impact on crucial issues such as recruitment and investment: the myth that there are ‘no women’ with the right skills to succeed in financial innovation, for example, is used as an excuse for poor gender diversity. Likewise, a lack of female investors and gendered views of pitching techniques mean that female entrepreneurs are disadvantaged by unconscious bias and narrow perceptions of ‘effective’ communication. All of these external barriers contribute to our internalised barriers, which are also shaped by wider aspects of our identities, personalities and lives. Some of these barriers include low confidence, excessive modesty, and feeling the need to mould ourselves to conventional (gendered) concepts of leadership or success. At times, the challenges we face can leave women with few resources to support each other – or even a sense that we’re forced to compete for the limited opportunities that are open to us. Yet our community of female leaders also recognised that women bring huge resources of their own to these challenges. We discussed how emotional intelligence contributes to self-awareness, personal resilience and assertive communication skills, while an ability to listen and read people enables collaboration and open conversations. Some use positive affirmations and mindfulness as tools for self-care and motivation, with many driven to succeed by a passion for their work and ‘self-inspiration’. So what can the sector do to support women? The short answer is: a lot. We are already seeing incubators that encourage women into the field and provide support for the challenges that they face, female-only professional networks, and blogs and podcasts that showcase inspiring women. But more needs to be done to champion female role models at all levels across the sector, introduce hiring processes that minimise gender bias, and enable allies to call out bad behaviour in the work place and beyond. 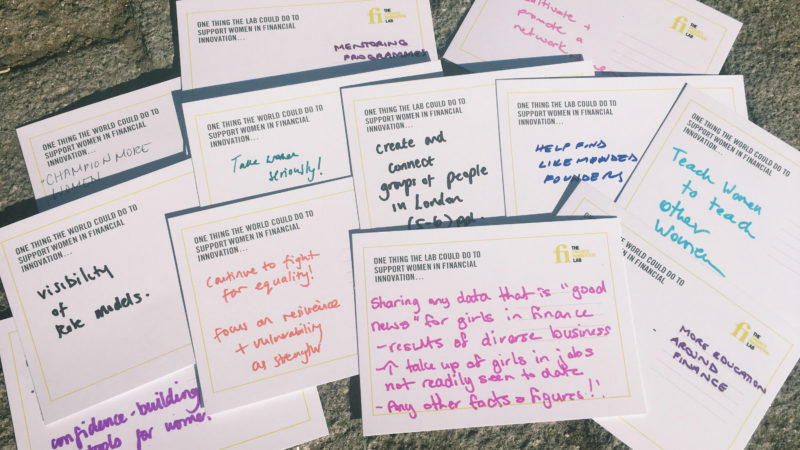 There’s also much more that the Lab can do to support women in financial innovation and we’re incorporating the ideas we heard on the night into our plans for Lab Fellowship and our Community of Practice. These include creating peer support networks and mentoring schemes, finding more ways to celebrate brilliant women and their innovative approaches in our communications, and organising trainings and skill-shares to help women develop confidence and navigate political situations at work. We’re also organising another event where we will share our ideas for next steps in more depth on 30 August. If you’re a woman working in financial innovation and would like to be involved, please email naomi@financeinnovationlab.org. You can also read the full summary of our first event here.